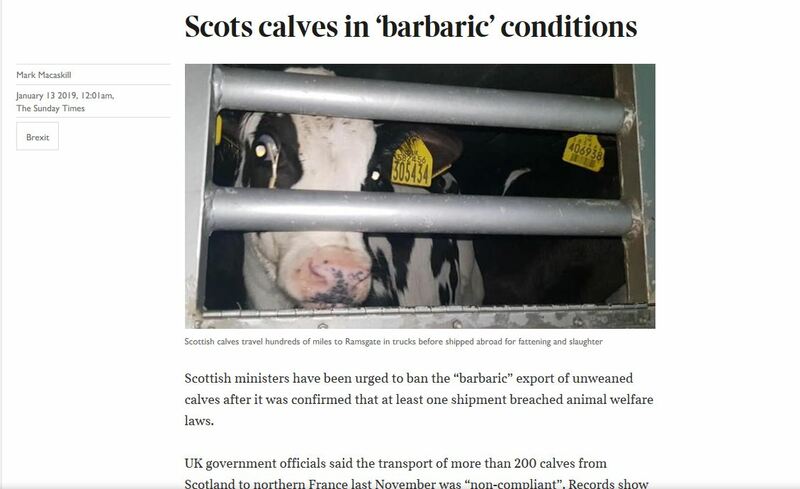 Scottish ministers have been urged to ban the “barbaric” export of unweaned calves after it was confirmed that at least one shipment breached animal welfare laws. UK government officials said the transport of more than 200 calves from Scotland to northern France last November was “non-compliant”. Records show that the animals, aged between four to six weeks, were driven to the English port of Ramsgate in Kent and spent almost 12 hours in the back of a cramped truck without adequate rest — three hours longer than the legal maximum of nine hours. It took almost 20 hours to reach a rest stop in northern France, during which time one animal died. Kay Hamilton, the Dowager Duchess of Hamilton and a keen animal rights campaigner, called for the trade to end. She buys milk from an ethical dairy south of the border. “Surely Scotland can keep the bull calves with their mothers till weaned? Fancy a Scot buying her milk from England,” she said. In January ,our Patron Zac Goldsmith MP tabled New Clauses 17 and 18 amendments to the Agriculture Bill to end live exports and introduce method of farming labeling.